In the previous article (part 2) we demonstrated that the focus and emphasis of the ascension of Jesus in Acts 1:9-11 was not on his physical body, but rather, it was the glory-cloud in which he was received into heaven, symbolizing his arrival into the presence of Jehovah to initiate his heavenly Kingdom. If you recall, in Acts 1:9 Luke specifically mentions the “cloud” which received Jesus in heaven, and in Luke 24:26 and 1 Timothy 3:16, both Paul and Luke mention “glory” in the context of that ascension. When we combine these texts, we can understand that the cloud which “received him out of their sight” was the “glory cloud” mentioned so often in the Old Testament scriptures, which represented the presence and power of Jehovah. This was the focus and emphasis of the ascension. In the present article, we will identify one more “covenant-element” which was present and emphasized at the ascension. This element should give us a better understanding of the purpose of the second coming of the Lord – why he was to come in “just the same way” – as prophesied in Acts 1:9-11. Let’s begin with a text which we have already looked at in this study, yet now, we not see it in “just the same way” as we have seen it before. And behold, I am sending forth the promise of My Father upon you; but you are to stay in the city until you are clothed with power from on high.” And He led them out as far as Bethany, and He lifted up His hands and blessed them. While He was blessing them, He parted from them and was carried up into heaven. 1. He was received by a cloud. 2. He was taken up in glory, to enter into his glory. 3. He was taken up while blessing his disciples. Therefore, Jesus had to return in “in like manner”. This means that Jesus must come “a second time” in the glory-cloud of heaven, to enter into his glory, and to bring a blessing for his disciples. To reiterate, the focus of the ascension (and by implication the second coming) in Acts 1:9-11 was not on the physical flesh and blood body of Jesus, but on the covenant-elements connected to the presence of Jehovah in both Old and New Testament scriptures. What places us on particularly solid exegetical ground concerning this interpretation of the focus and emphasis of the ascension in Acts 1:9-11, is the fact that the New Testament writers, and Jesus himself, mention all these elements – the cloud, the glory, and the blessing, in their prophesies and expectations of the second coming. In other words, New Testament prophecy concerning the second coming of Jesus anticipated his coming again on: (1) the clouds of heaven, (2) in glory, and (3) in blessing for his people. And significantly, so did the prophets. So before we go to the New, let’s look at one Old Testament prophecy which contains all these elements, and serves as one of the primary sources for all New Testament prophecy – including Acts 1 – concerning the second coming. I kept looking in the night visions, and behold, with the clouds of heaven One like a Son of Man was coming, and He came up to the Ancient of Days and was presented before Him. And to Him was given dominion, glory and a kingdom, that all the peoples, nations and men of every language might serve Him. His dominion is an everlasting dominion which will not pass away; and His kingdom is one which will not be destroyed…. But the saints of the Highest One will receive the kingdom and possess the kingdom forever, for all ages to come. Notice the “second coming elements” in Daniel’s vision. Now, let’s look at several New Testament prophesies which clearly anticipate the return of Jesus, in “just the same way” (in like manner) as the disciples had seen him go into heaven. Mathew 16:27 contains the elements of glory and blessing. To “repay (reward) every man according to his deeds” in the context of the Kingdom, refers to the righteous receiving the Kingdom as their heavenly blessing at the coming (return) of the Son of Man. And then the sign of the Son of Man will appear in the sky, and then all the tribes of the earth will mourn, and they will see the Son of Man coming on the clouds of the sky with power and great glory. And He will send forth His angels with a great trumpet and they will gather together His elect from the four winds, from one end of the sky to the other…. Truly I say to you, this generation will not pass away until all these things take place. Then they will see the Son of Man coming in a cloud with power and great glory. But when these things begin to take place, straighten up and lift up your heads, because your redemption is drawing near…. So you also, when you see these things happening, recognize that the kingdom of God is near. Truly I say to you, this generation will not pass away until all things take place. Both Mathew 24:30-34 and Luke 21:27-32 contain all three elements found in the Acts 1 and Luke 24 ascension texts, as well as in Daniel 7. The Son of Man was to come (return) in the clouds of heaven, in power and great glory. Concerning the “blessing”; he was to “gather together his elect” into the Kingdom, where they would receive their “redemption”. This is the reward of the Kingdom that Jesus promised in Mathew 16:27, and that Daniel saw in his vision (7:18,22,27). And, specifically concerning the element of “blessing”, the writer of Hebrews tells his struggling and persecuted Jewish readers that at the return of Jesus – his “appearing a second time” – he would bring salvation for them. Thus, as the disciples had seen Jesus ascend in to heaven – in the cloud, into glory, while blessing – they as well as Jesus himself expected and prophesied his return “in just the same way”. This validates our interpretation of the focus and emphasis of Jesus’ ascension in Acts 1:9-11. At the risk of sounding repetitive, the ascension of Jesus did not point to the return of a 5’5” Jewish man in his flesh and blood body, but to the glorious return of the covenant-presence of Jehovah to his people. In the next and final article, we will prove beyond doubt that the second and final coming of Jesus Christ as prophesied in Acts 1 was fulfilled in the lifetime of Jesus’ first century disciples, when he arrived with the clouds of heaven, in the glory of his Father, and brought the blessing of salvation to those who had received that promise. …. Continued in Part 4…. For more on the relationship between Daniel 7 and the coming of the Son of Man as predicted in the NT, see Don K. Preston’s book, We Shall Meet Him In The Air: The Wedding of the King of kings. 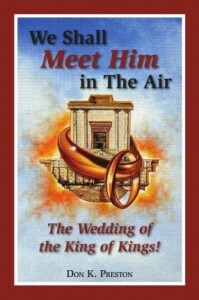 For a great discussion of Daniel 7 and the coming of the Lord “in like manner” get a copy of this book!